As mining operations cease bulldozers and scrapers are used to reshape the disturbed area. Reclamation should allow for the area to be resistant to soil erosion and, based on the soil requirements, fertilized and revegetated. Reclaimed land can be used for agriculture, forestry, wildlife habitation, and recreation. The cost of the rehabilitation of the mined land is factored into the mine’s operating costs. Land Disturbance - coal mining can lead to the degradation or disturbance of forests, mountaintops and streams from mountaintop removal, surface and ground water, soils, local land use, native vegetation, and wildlife populations. Mine subsidence - this refers to the destablization of land that can occur with underground coal mining, as the ground level lowers as a result of coal having been mined beneath. Water pollution - Acid mine drainage (AMD) is metal-rich water formed from the chemical reaction between water and rocks containing sulphur-bearing minerals. The acid run-off created dissolves heavy metals such as copper, lead, and mercury into ground and surface water. There is also danger from coal sludge, also known as slurry, the liquid coal waste filled with toxins produced by mining activities. Coal reclamation grew out of a concern about the environmental effects of strip mining. Coal had been mined in the United States since the 1740s, but surface mining did not become widespread until the 1930s. At the end of that decade, states began to enact the first laws regulating the coal mining industry: West Virginia in 1939, Indiana in 1941, Illinois in 1943, and Pennsylvania in 1945. Despite those laws, the great demand for coal during World War II led to coal being mined with little regard for environmental consequences. After the war, states continued to enact and expand regulatory programs, some of which required mining permits or the posting of bonds to ensure that the land could be reclaimed after mining was complete. But these state laws were largely unsuccessful at stemming the environmental impacts of surface mining. One problem was that the law varied from state to state, enabling mining operations to relocate to states where regulations were less strict. Meanwhile, surface mining became increasingly common: in 1963 just 33 percent of American coal came from surface mines; by 1973 that figure reached 60 percent. the reestablishment of wildlife and aquatic habitat and resources. In 1974 and 1975 Congress sent mining regulation bills to President Gerald Ford, but he vetoed them out of concern that they would harm the coal industry, increase inflation, and restrict the energy supply. As Jimmy Carter campaigned in Appalachia in 1976, he promised to sign those bills. Congress sent him a bill that was even more stringent than those vetoed by Ford, and President Carter signed it into law on August 3, 1977, leading to the Surface Mining Control and Reclamation Act (SMCRA) of 1977 and establishment of the Office of Surface Mining Reclamation and Enforcement (OSMRE) within the US Department of the Interior. SMCRA is the primary federal law that regulates the environmental effects of coal mining in the United States. SMCRA created two programs: one for regulating active coal mines and a second for reclaiming abandoned mine lands. SMCRA also created the Office of Surface Mining, an agency within the Department of the Interior, to promulgate regulations, to fund state regulatory and reclamation efforts, and to ensure consistency among state regulatory programs. States can establish agencies that are often given primacy over the federal agency in the implementation of their program, such as the Wyoming Department of Environmental Quality, Land Quality Division (WDEQ-LQD). SMCRA created an Abandoned Mine Land (AML) fund to pay for the cleanup of mine lands abandoned before the passage of the statute in 1977. The law was amended in 1990 to allow funds to be spent on the reclamation of mines abandoned after 1977. The fund is financed by a tax of 35 cents per ton for surface mined coal, 15 cents per ton for coal mined underground, and 10 cents per ton for lignite. 80% of AML fees are distributed to states with an approved reclamation program to fund reclamation activities. The remaining 20% are used by OSM to respond to emergencies such as landslides, land subsidence, and fires, and to carry out high priority cleanups in states without approved programs. States with approved programs can also use AML funds to set up programs to insure homeowners against land subsidence caused by underground mining. For reclamation, money from the Fund is used for "reclamation and restoration of land and water resources adversely affected by past coal mining, including but not limited to reclamation and restoration of abandoned surface mine areas, abandoned coal processing areas, and abandoned coal refuse disposal areas; sealing and filling abandoned deep mine entries and voids; planting of land adversely affected by past coal mining to prevent erosion and sedimentation; prevention, abatement, treatment, and control of water pollution created by coal mine drainage including restoration of stream beds, and construction and operation of water treatment plants; prevention, abatement, and control of burning coal refuse disposal areas and burning coal in situ; prevention, abatement, and control of coal mine subsidence; and establishment of self-sustaining, individual State administered programs to insure private property against damages caused by land subsidence resulting from underground coal mining" (SCMRA, Section 401(c)(1)). Priority is given to those sites which are in the immediate vicinity of a residential area or which have an adverse economic impact upon a local community. In January 2010, the AP Press reported that $395 million was available for abandoned-mine reclamation funds provided by the U.S. Department of the Interior. Recipients can apply to the Interior Department's Office of Surface Mining Reclamation and Enforcement for funding for specific projects. Part of the money - $150 million - comes from fees based on U.S. coal production. The remaining $245 million comes from the U.S. Treasury, or taxpayers. Since 1977, the program has provided more than $7 billion to clean up more than 285,000 acres. On June 12, 2011, the U.S. Supreme Court turned away a bid by coal companies led by Consol Energy for a refund of some of the fees they have put into a U.S. government coal mine reclamation fund. The industry appeal also included units of Massey Energy, Patriot Coal, Alpha Natural Resources, Arch Coal, BP, TECO Energy and Peabody Energy. The companies argued unsuccessfully that the fees were being applied to coal destined for shipment abroad (coal exports), violating the constitutional prohibition on export taxes. A lower court said the fees were being imposed on coal as it was being extracted, not as it was being exported. The companies were seeking both a halt to the fee and refunds. Tom Goldstein, the lawyer representing the companies, declined to say how much money they were seeking. On December 15, 2010, the group Public Employees for Environmental Responsibility (PEER) asked the Pennsylvania Auditor General to investigate the use of coal waste to reclaim old coal mines, citing an alleged dereliction of duties by two state agencies. Pennsylvania pursues a policy of “beneficial use” of coal ash from power plants and kilns by pouring the wastes down abandoned mines despite, PEER said, the documented risks of severe water pollution, toxic vapor and even fire dangers. PEER specifically targeted the principal report used to secure state regulatory approval of using coal ash as mine fill, "The Use of Dredged Materials in Abandoned Mine Reclamation," a report based on the Bark Camp Demonstration Project. A hydro-geologic expert, Robert Gadinski, filed a formal complaint with the Pennsylvania Department of State in April 2008 about the lack of qualifications of the author of the Bark Camp report, under laws requiring state licensure for geologic consulting work in Pennsylvania. The Department has yet to act on Gadinski’s complaint. Underground combustion of coal ash wastes. Gadinski also filed complaints and reports with the Pennsylvania Department of Environmental Protection (DEP), arguing that its reliance on the Bark Camp report was imprudent and legally questionable. PEER requested that the state Auditor General conduct a “performance audit” on both the Department of State for failure to enforce licensure laws and on the DEP for issuing reclamation permits on the basis of "unreliable information amassed from an individual unauthorized to practice geology." Coal mine reclamation leaching coal waste in KY. Photo courtesy of ilovemountains.org. Due to lax enforcement, the National Wildlife Federation (NWF) initiated the Surface Mining Project in 1979 to promote strong implementation of SMCRA, a project maintained with funding from the Public Welfare Foundation and the Ford Foundation. 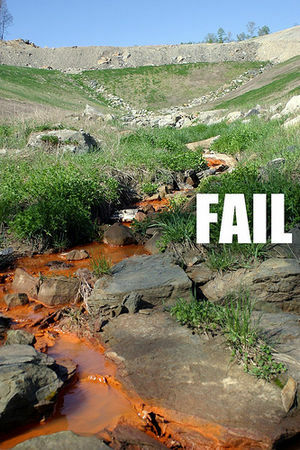 According to the NWF, in the years immediately after the passage of SMCRA more than half of all federal orders for mine reclamation were ignored by coal companies. Also, the government failed to assess more than $200 million in SMCRA penalties against coal companies. By 1995, one in four of the 25,000 coal mines established set for reclamation had not been reclaimed. In the early 1980s, SMCRA came under direct attack by the government itself: Interior Department secretary James Watt. Watt not only refused to enforce the law, but oversaw attempts to weaken about 100 SMCRA regulations. Federal courts, in lawsuits brought by NWF and other groups, threw out most of Watt's changes. Contractors - "a large coal-owning corporation signs a contract with a small company, which agrees to mine one of the large company's coal deposits. The contractor obtains the permit to mine the coal, takes on liability for reclaiming the site and, for a fee, hands over the coal to the large corporation to sell. But these small contractors, chronically short on capital, frequently cannot fulfill their SMCRA obligation to clean up mine sites. If the small company folds, the site is left unreclaimed." Shell corporations - "a group of investors creates a small corporation which becomes the owner of underground coal, applies for mining permits and assumes responsibility for reclaiming the mine. However, once the coal is out of the ground and sold, the corporation simply dissolves, leaving an empty shell with no assets and no one to punish for failure to reclaim the mine site. The investors then go on to create new companies." To prevent these tactics activists file a complaint with the Office of Surface Mining (OSM) in the U.S. Interior Department. If OSM accepts the complaint, it "permit blocks" the offending company, and the company gets no new permits until past violations have been corrected. This is disruptive to a company since before it can mine anywhere, it needs a government permit. ↑ 3.0 3.1 3.2 Brenda K. Schladweiler, "Comparison of Reclamation of Coal Mines" Paper presented at the 2009 National Meeting of the American Society of Mining and Reclamation, Billings, MT, Revitalizing the Environment: Proven Solutions and Innovative Approaches May 30 – June 5, 2009. R.I. Barnhisel (Ed.) Published by ASMR, 3134 Montavesta Rd., Lexington, KY 40502. ↑ "W.Va. starts spending $51M in reclamation funds" PhillyBurbs, Jan. 3, 2010. ↑ Jim Rubin and Laurie Asseo, "Coal Companies Rejected by U.S. Supreme Court on Fee Refund Bid" San Francisco Chronicle/Bloomberg, June 12, 2011. ↑ Jeff Stant and Traci Barkley, "Illinois at Risk: Lax safeguards and no enforcement endanger the water, air & lives of residents near coal ash dumps" Prairie Rivers and Environmental Integrity Project report, August 17, 2011. ↑ 11.0 11.1 11.2 11.3 "Eco Risks of Coal Ash as Mine Fill Understated" PEER, Dec. 15, 2010. This page was last edited on 22 August 2011, at 15:14.